The female aggressor then fled the scene while the men from the group moved in to beat their victim. After being knocked to the ground by the left wing extremists, the 20-year-old said she tried to protect herself, but that the mob then “started kicking [her] in the head”. The woman denied being a member of any political groups and said she was targeted for wearing jewellery which featured “no political symbols, it was just a bracelet of the flag of Spain”. “They beat me for that, they want to ban us from carrying our flag”, she said on Monday. Police don’t have a definitive motive for the attack so far, but said it’s feasible that the sight of a Spanish flag caused the leftist mob to launch the brutal attack. If confirmed to have been the reason for the assault, the source noted it would constitute a hate crime. In a press conference on Tuesday, Spain’s interior minister Juan Ignacio Zoido described the attack in Murcia as “evil”, and called for the “full weight of the law” to be brought against the perpetrators of the “horrible act”. 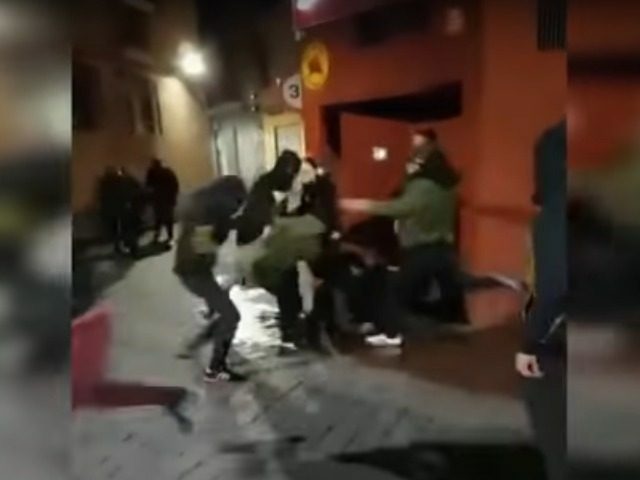 The attack on Sunday comes amidst a rise in violence and extremism from the radical left in recent years, and Spain’s Interior Ministry has warned for some time that left wing extremism poses a threat to the nation.